This is what it's like when worlds don't collide. 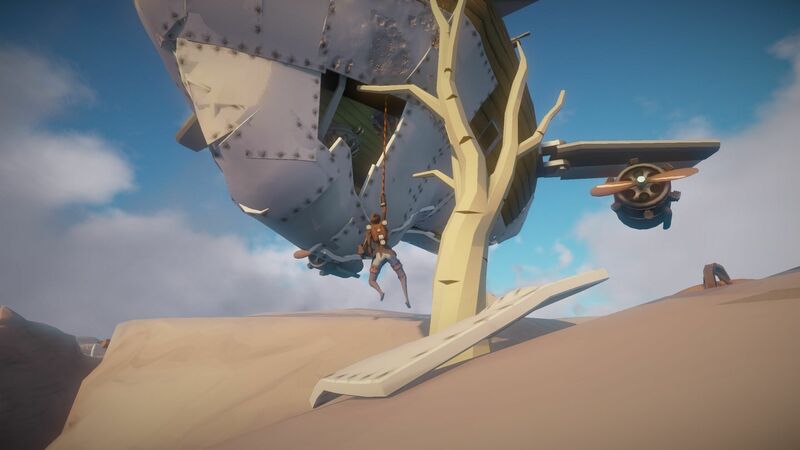 From the developer that brought you a goofy send-up of the dry simulator genre and a game where you literally play as a slice of bread comes…an ambitious survival/crafting game set amongst the floating, cloud-flanked islands of a fractured world? Yeah, I’m just as surprised. This is Worlds Adrift, the latest game from Bossa Studios (of Surgeon Simulator and I Am Bread fame). 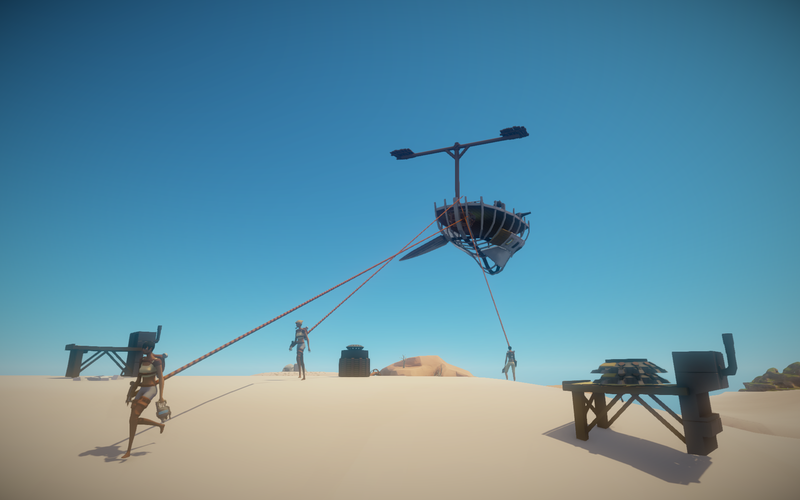 Worlds Adrift is “Survival Game on Floating Islands.” Er…plus flying boats and ancient ruins and a grappling hook and a wingsuit and some other crazy stuff. Here are the basics: You’ll spawn on one of the game’s innumerable floating islands (more will be seamlessly added and the map expanded as the game’s playerbase grows), gather resources, build your first flying ship, and then set off to explore. You can also glide around using a wingsuit, or swing around like Spider-Man thanks to an infinite supply of grappling hooks. It’s the most ambitious game we’ve seen from Bossa, which—up until now—has been known for what I consider “gimmick games.” Surgeon Simulator and I Am Bread are both tailor-made for the Twitch/YouTube crowd: A silly concept that naturally leads to hilarious in-game moments but isn’t necessarily as much fun to play on your own. See also, Goat Simulator. The term’s a bit too condescending in my opinion, because it implies that what came previously wasn’t worth anyone’s time. And that’s rarely true—The Beatles put out some masterful pop songs before Revolver, and Naughty Dog’s early games (Crash Bandicoot, Jak and Daxter) are beloved classics. 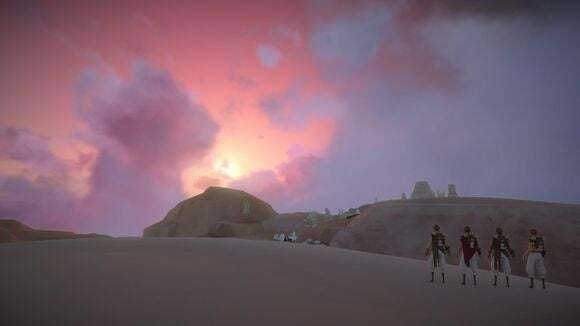 And yet what makes Worlds Adrift so interesting (at least to me) is that it’s also identifiably a Bossa game. The core tenets are here: Deep, systems-based mechanics. A devotion to emergent gameplay and enabling player creativity. Moment-to-moment silliness. It’s the spirit of Surgeon Simulator or I Am Bread, but couched in a more serious framework. Spending an hour with Bossa means hearing one crazy story after another, like when they discovered you could grab arrows out of the air. Or when they discovered you could hook your grappling hook to a cannonball as it’s fired, yanking you into the air for an impromptu ride. Or how you can spin the mouse as you swing off your grappling hook, causing your physics-governed ragdoll to do the sorts of twirls and flips that were preprogrammed into Spider-Man games. Another example Bossa’s fond of involves a ship-to-ship battle where one craft dumped a heavy object onto the other’s deck, overloading the tinier ship’s engines and slowly forcing it to ground. I’m attracted to this sort of chaos, to Bossa’s mantra of “Give players all the systems up front and let them test the constraints.” That sort of approach is diametrically opposed to telling any sort of coherent (read: linear) story, but it’s fantastic if your goal is to empower players.It’s what made Surgeon Simulator special. It’s what made I Am Bread an excellent idea, even if the game didn’t quite work. 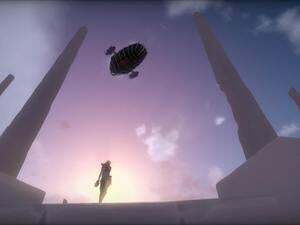 And it’s what makes Worlds Adrift worth keeping an eye on, even in a crowded me-too genre.